After final installation of your solar panels can be one of the most frustrating part of the solar process! You’re connected to the grid, now it’s just a matter of time. Unfortunately, this is the time when our customers get anxious. Don’t worry, we want your system up and running as much as you and we’ll be with you every stage of the process. Installation (1-3 Business Days) Our installation team will safely install and commission your system. Inspection (1-4 Weeks) When your installation is finished, the city or county is required to do a final inspection before your system can be connected to the grid. Depending upon the time of year, the backlog of solar inspections, and the sheer competence of your local government, the estimated time to complete this step is generally 1-4 weeks. System Activation (2-4 Weeks) You’re connected to the grid, now it’s just a matter of time. Unfortunately, this is the time when customers get anxious. The utility company has to install the bi directional meter and have it come on line to track how much energy you’re producing. We have little control over how long this step is going to take which can be up to 4 weeks. (1-2 Hours) Demonstrating your solar system; inverter reading to shut down. Interested in solar but not sure if it's right for you? 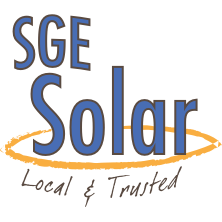 Contact SGE Solar for a free no-obligation solar consultation.